Republican presidential nominee Donald Trump and Democratic presidential nominee Hillary Clinton will meet for their second debate Oct. 9, 2016, in St. Louis, Missouri. In the aftermath of Tuesday's vice presidential debate, the focus has shifted to the second presidential debate between Democrat Hillary Clinton and Republican Donald Trump, which will be Sunday in St. Louis, Missouri. Trump in particular has a lot riding on his performance in the second debate: It could be one of his last opportunities to turn the race around. Some early polls and many pundits gave Republican Mike Pence a slight edge over Democrat Tim Kaine in the only vice presidential debate. 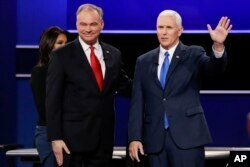 Pence's cool, calm performance Tuesday night has a number of Republicans hoping that Trump might choose to channel his running mate in Sunday’s debate. FILE -- Republican vice-presidential nominee Gov. Mike Pence and Democratic vice-presidential nominee Sen. Tim Kaine, left, met at Longwood University in Farmville, Virginia, for their debate Oct. 4, 2016. Trump was very much center stage in the vice presidential debate. Kaine brought up several of Trump’s most controversial statements during the 90-minute debate in hopes of putting Pence on the defensive. Pence did often choose to ignore the attacks on Trump and tried as often as he could to turn his focus to Clinton’s record as secretary of state. “The situation we are watching hour by hour in Syria today is a result of the failed foreign policy and the weak foreign policy that Hillary Clinton helped lead in this administration and create,” Pence said. Historically, vice-presidential debates change few minds in a presidential election campaign, and many analysts said this one is likely to be no different. “I think the Democrats will like a little bit of aggression and fire towards Donald Trump, and I think that the Republicans like the sort of calm steadfastness of Governor Pence,” said Austin Hart of American University. Hart added that Pence was able to “right the ship a bit” by showing a steady demeanor in the face of aggressive prodding by Kaine. On the other hand, Kaine managed to score points by “keeping the focus on Donald Trump,” Hart said. With the focus now on Sunday’s second presidential debate, Trump is signaling an aggressive approach that might involve resurrecting the Bill Clinton impeachment saga in the second term of his presidency. Trump performed a shaky walk earlier this week at a rally in Pennsylvania as he poked fun at Clinton’s recent bout with pneumonia. “She is supposed to fight all of these different things and she can’t make it 15 feet to her car. Give me a break,” Trump said to cheers from the crowd. Clinton’s lead in national and some key state polls has surged in the wake of the first debate, and she is likely to emphasize unity in her next faceoff with Trump, as she did this week with supporters at a rally in Coral Springs, Florida. “My view is, we are already great and if we work together, we will become even greater in the years ahead,” she said. Will Trump Seize the Opportunity? The next debate could give Trump an opportunity to reset the race and rebound from his performance in the first debate, said George Washington University’s Matthew Dallek. 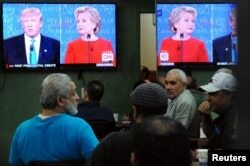 FILE -- People watch the first U.S. presidential debate in a restaurant, Sept. 26, 2016, in the Queens borough of New York City. “So if he can improve on some of his answers, show more knowledge, and not be as wild-eyed as he was in the first debate, it could be very different,” he said. Dallek sees the Trump-Clinton battle in one sense as a contest of trust versus temperament, noting polls that show Clinton’s challenges in convincing voters that she is trustworthy and voters’ doubts about Trump’s temperament. Many conservatives were disheartened not only with Trump’s first debate performance but also his Twitter attacks in the days that followed targeting Alicia Machado, a former Miss Universe. “The more he talks about that, that doesn’t help him. It is what you would call off-message,” said Weekly Standard Editor Fred Barnes on VOA’s “Issues in the News” program. The next Clinton-Trump debate features a town hall format where the candidates will field questions from moderators and from voters invited to attend. That could present a challenge to Trump if he chooses to attack Clinton while answering a question from a voter. Trump captured the Republican Party nomination in no small measure because of his performance in the numerous primary debates. But the general election debates are a different matter. A third presidential debate is scheduled for October 19 in Las Vegas, Nevada.